In an ongoing business scenario the transportation rates related to your standard transportation profile are known and administered in your transportation management system or in the ReturnPool Freight Audit and Payment environment. However, when business is changing and new transportation lanes need to be added to your business efficiently obtaining market-competitive rates can be a challenge. 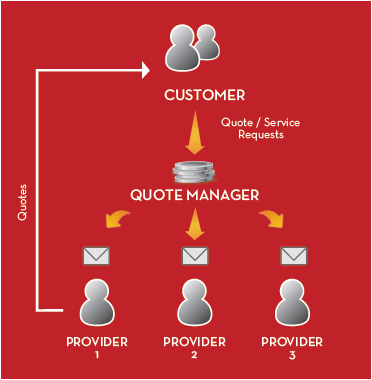 For this reason, ReturnPool has developed an online (spot) quote manager through which you can request (ad hoc) transportation rates to predefined logistics service providers (LSP’s). Using the quote management solution, you can submit request for quotations by entering your new transportation requirements. The system will automatically invite and alert the predefined providers to submit their quotation via the online portal. Their responses are subsequently stored and shared with all your team members. Assist you in improving your (ad hoc) quotation request process. Allow you to accurately measure the number of requests that have been sent to each of your providers. Avoid the submission of double rate requests. Give you the possibility to actively follow new incoming quotations. Help you monitor the provider response time related to your request. Keep track of which rates from which providers have been accepted and have converted into a service. Issue online ratesheets that can be shared with team members at different locations. Keep track of all the historic rate requests to your LSP’s and their responses.